Yesterday, the Giants placed linebacker Antonio Pierce on injured reserve, ending his season and, in all likelihood, his Giants career. As Ralph Vacchiano pointed out, Pierce's injury is all the more frustrating because right now he doesn't feel hurt: An MRI showed a bulging disc in his neck, and the risk of permanent injury is too high to risk playing. So he's done, and with one year remaining on his contract, the Giants might just cut him in the off-season. It's a shame. He's really had quite a Giants career. 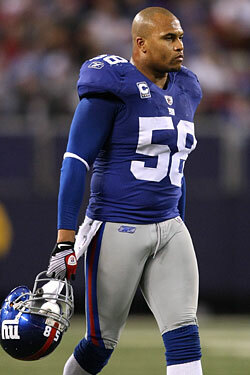 Giants spokesperson Peter John-Baptiste informed reporters that Pierce would not be taking any questions that day. ... The reporters did the Charlie Brown Good Grief head-down walk away from the locker, destined to disappoint their editors. Pierce then turned around, wearing only jeans, and fixed his eyes on the ceiling, above everyone, defiant, daring anyone to try to ask him something, anything. I think he puffed out his chest a little. He didn't need to. It was clear to everyone, just like on the field, who was in charge. Pierce also found himself some trouble here and there, groping a dancer on a strip-club security camera and, most famously, hanging out with Plaxico Burress the evening of the leg-shooting incident. He's also beloved in the community and clearly wants a post-retirement broadcasting career, at one point even serving as a "communications intern" for Howard Stern. (His wife is former SNY personality Jocelyn Pierce.) He has been a major force on the New York sports scene for the last five years, and now it might be over. The Super Bowl from a couple of years ago seems farther away than ever, doesn't it?